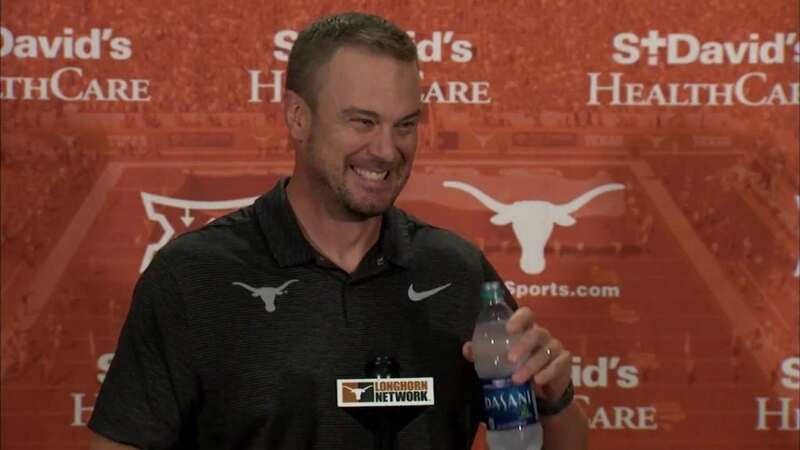 Texas head coach Tom Herman was a bit happier when he met with the media Monday following Texas win over TCU (photo courtesy of texassports.com). AUSTIN, Texas — The surging Texas football team has played quite well in toppling two ranked teams the past two weeks at home. Those victories won’t give the Longhorns a leg up on anything when they travel to Manhattan, Kan., Saturday to square off against always-dangerous Kansas State. The Longhorns, now 3-1 on the season and ranked 18th in the latest Associated Press poll, haven’t won in Manhattan since 2002. "Since (Texas safety) Caden Sterns was 2 years old,” Tom Herman said Monday in his regular media availability. The Longhorns' head coach was happy and smiling following the recent run of success, but made sure to remind the media what he has told his team since the win over the Horned Frogs.